It is not uncommon for college teachers to experience a tug-of-war between their teaching and research responsibilities. Academic advancement requires considerable time devoted for quality research, however teaching and other administrative tasks remain the primary obligation for faculty. This article is a personal take on how science faculty at The IIS University (an autonomous center of higher education, and a deemed-to-be university, in Jaipur) balance teaching and research roles. Broadly based on UGC norms but not confined to them, we follow an internal appraisal system for faculty. Provisions are incorporated where faculty members involved in student activities are also given due credit. Research is promoted but not at the cost of teaching or other related activities in which students require supervision and guidance. Student feedback at departmental and institutional levels is also used to bridge the existing gap between teaching and learning. Faculty are encouraged to apply for projects (funded in-house) during their initial years of employment. A peer-committee actively looks after the research needs of teachers’ projects. It also provides myriad resources to support the scholarly contributions, skills and research activities among young faculty. Organising workshops and seminars on research methodology and appraising faculty for significant contribution in research, are some such initiatives. A biannual science newsletter is the canvas to cumulate the scientific acumen of undergraduate and postgraduate students by way of short scientific communications. Under the supervision of teachers the student editorial board play the key role in publication of the newsletter, Science spectrum. It covers popular science news, articles, biographies of scientists along with a bird’s eye view of the recent activities related to science on- and off-campus. The IIS University Journal of Science and Technology (JOST) promotes public awareness and understanding of all aspects of science: experimental, theoretical and laboratory research. Creative ways of covering the syllabus are encouraged by the administration. We frequently employ small research problems to give students a peek into real-world applications of syllabus content. Through this process, students are exposed to the basic steps involved in research and preparing a project proposal acts as a learning experience for them. Frequently, these projects are based on matters of local relevance. 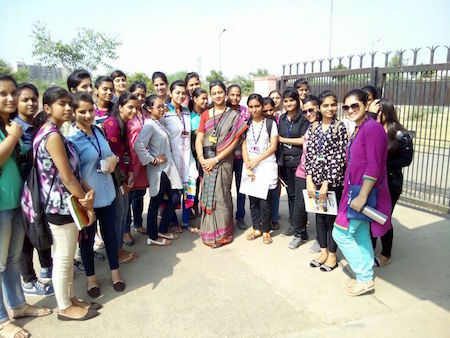 For instance, students from our department worked on bacteriological assessment of street-vended Panipuri or analysis of unprocessed fruit juices from local market of Jaipur. Their results gave initial data for quality enhancement of the products and created a base for further detailed research on the same subject. The success of such schemes is evidenced by the fact that in the current session the number of undergraduates who applied for projects outnumber the intake capacity of department faculty. Whenever possible, we take advantage of the fact that the present generation of students is intensely tech-savvy. The university has made available for free use of all faculty and students, a software called Metacampus that effectively helps teachers create online content. There is a uniting belief among us to use curriculum as a tool to help our students develop their cognitive abilities and critical thinking. To inculcate the habit of reading research papers, masters’ students in our department are encouraged to select relevant scientific research papers to present as their seminar. Though majority of the students remain apprehensive at the very thought of going through scientific article, we aim to comfort their fears. From choosing the journal to searching the pertinent information, department faculty remain in touch for all related queries. Incorporating research thrust areas in my classroom has helped me become a more effective teacher. For instance, while covering topics pertaining to environmental microbiology, I apprise my students on the latest research trends in microbial bioremediation of di-azo dyes and heavy metals in industrial wastewater (focus of my research). While teaching cancer biology and immunology, students are shown the mice infected with prominent skin carcinomas in our Animal Facility. That, along with short description of research projects these animals are being used for, gives students context for their curricular content. Likewise fellow educators can also incorporate such small yet interesting research topics which help students to see the same thing with a different view point.